I came across a copy of R.C. 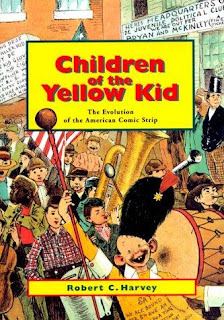 Harvey's Children of the Yellow Kid, I think, about five years ago in a Half Price Books. It'd been marked down to $3.00, so I couldn't pass up that deal. However, it's managed to sit unread on my shelf until recently. The short description of this book is that it's a history of newspaper comic strips in America. Which is precisely why I didn't dive into reading it right away; it didn't seem to be an overly detailed synopsis, so I assumed I already knew the bulk of what was covered. Hogan's Alley, Little Nemo, Krazy Kat, Prince Valiant, Peanuts... Yup, got it, know all that. And while Harvey's book doesn't delve too deeply into any one artist or strip, it covers a surprising amount of territory and exposed a great many holes in my personal comic strip knowledge. Most of the art that is presented in the book are of the original art, several pieces in fact are printed at or near full-size. Interestingly, and much to Harvey's credit, he lets the artwork stand on its own for the most part and writes about the strips more from an anthropological perspective. What was going on in the country at the time? Why was there a broad change in practices across so many strips nearly simultaneously? What events/people were creators responding to? I think this is what really struck me about the book; that it was able to put so many movements in comics into perspective. Having been born well past the heyday of many older strips, my familiarity with, say, Little Orphan Annie or Mary Worth comes from the daily strips that were contemporary for me. Which is to say, continued on by someone other than the original creator in a very different climate than when they were first developed. The histories I'd read previously were either exceptionally focused on a single creator or work, or they were presented in the broader context of comic books and not treated as a unique medium. I don't know how common that type of historical, societal perspective is in strip histories, but much of the information and context presented in Harvey's book was certainly new to me. My one real complaint with the book deals with the art. The images themselves were wonderful, and I particularly enjoyed examining some of the larger pieces. But their placement throughout the book was somewhat vexing, in that they were rarely placed anywhere near the text that referenced that strip or artist. When I got to the portion of the book talking about Milton Caniff, I had to turn back a dozen pages to look at the referenced artwork. I understand that not every image could be placed precisely next to the text that refers to it, but there were very few instances where I didn't have to turn at least four or five pages one direction or another to see which specific strip was being referred to. I did learn a great deal here, and in fact just ordered Harvey's biography of an artist I had never even heard of before, Gus Arriola, in part because I realized just how little about newspaper strip history I know. But Children of the Yellow Kid was a very insightful read, and I'm just sorry I let it sit on my shelf for so long before cracking it open.